Netflix continues to be our number one streaming platform when it comes to the best of the best TV on offer. It has a huge range of exclusives, originals and classics to get stuck into. That huge range can make it tricky to know which is the best Netflix series to watch, especially as it's constantly being updated with such a great mix of shows, both old and new. That's why we've put together this guide to the best Netflix shows you can watch in the UK – and to keep up with Netflix's busy release schedule, we'll be updating it once a week. 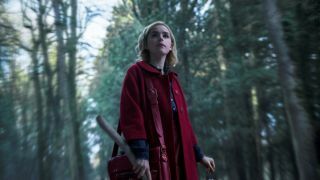 There are some brilliant shows to watch on Netflix this month; we've got the second season of The Chilling Adventures of Sabrina, plus the David Attenborough-narrated Our Planet to tuck into. Brie Larson's directorial debut Unicorn Store has also landed on Netflix this month, while the rest of the month looks to be pretty quiet – although thriller fans may be looking forward to the second season of The Protector, which comes out on April 26. Then there's a lot to get excited about later in the year too. The third season of GLOW will land at some point before the end of Summer 2019 and fans of Stranger Things will be happy to hear that Netflix has now confirmed the highly-anticipated third season will arrive on July 4 2019. We're also anticipated that the third season of The Crown will be hitting our screens this year. It's set to return with an all new cast, with Olivia Coleman starring as Queen Elizabeth II as the series moves onto the next chapter of her reign. April gets off to a great start with season two of The Chilling Adventures of Sabrina and the Brie Larson-directed comedy The Unicorn Store. Also new this month is the David Attenborough-narrated Our Planet – check out our pick of the best Netflix documentary series on the streaming platform for true crime, nature, and everything in between. In movie news, the Jurassic Park trilogy is coming to UK Netflix on April 16. Check out our roundup of the best movies on Netflix UK for more excellent film choices. March on Netflix saw in season 5 of Brooklyn Nine-Nine, as well as the last half of the fifth season of Arrested Development and the third season of Queer Eye (yaaasss hunny). That's not all. Later that month, we also welcomed the third season of The Santa Clarita Diet as well. In other Netflix news, the streaming platform has now amassed an enormous 139 million subscribers, more than the populations of Tokyo, Delhi, Shanghai, Sao Paolo, and Mumbai combined. Now that Apple has released its own streaming service, Apple TV Plus, will this change? We think not, but only time will tell. Check out Apple TV Plus vs Netflix for more information on the fledgling platform. What's coming soon on Netflix? One of the best things about Netflix is it really does cater for every kind of taste. From gritty true crime and thrillers through to fantasy, space adventures and plenty of cartoons and fun for kids. We can’t guarantee it, but we’re pretty sure there’s something for everyone. Let’s not forget that a lot of the best Netflix series right now are originals that have been created by the Netflix team and the studios behind them. In short, Netflix is really on a roll. Basic– £5.99 per month – With the cheapest membership option, you can watch one one screen at a time in Standard Definition, and download videos to one mobile device. Standard – £7.99 per month – This membership allows you to watch in HD on two screens at a time and download videos to two mobile devices. Premium – £9.99 per month – The most expensive subscription allows you to watch in HD and Ultra HD on four screens at a time, and download videos to four mobile devices. Netflix says that "High Definition (HD) and Ultra High Definition (Ultra HD) availability subject to your internet service and device capabilities and not all content [is] available in HD or Ultra HD." How can I get a free Netflix account? Netflix offers new customers a free month of the service as a trial period – simply choose a membership type and payment plan and your first month will be free. At the end of this period, if you choose to continue watching Netflix, you'll be charged one "low monthly fee" regardless of how much you used the service and on how many devices you watched videos on. Netflix will send you a reminder towards the end of your trial period – if you want to cancel your membership, you can do so at any time during this period and you won't be charged. Can I watch live TV on Netflix? No – you can only watch films and TV series from Netflix's rather extensive library. If you want to watch live TV in the UK, you can try services like Sky's Now TV, BBC iPlayer, or ITV Hub. Is Amazon Prime better than Netflix? The answer to that question really depends on the shows and movies you want to watch. Check out our roundup of the best Amazon Prime Video TV Shows for an idea of what you can watch on Amazon Prime. You can also read our Amazon Prime review for more information on what the service offers. Do you get Netflix free with Sky Q? Netflix can be accessed on a Sky Q box, but it doesn't come for free – you'll still need to sign in with a paid-for Netflix subscription. However, if you opt for Sky's Ultimate on Demand package, it will integrate Netflix billing with your Sky bill, while reducing its cost and unlocking Netflix recommendations within the Sky Q interface. If you're paying for both services, it's well worth combining them in this way as a result.